Another Thanksgiving is gone and forgotten. You know, except for the inevitable leftovers that are apparently multiplying in my fridge. I swear to you, four days after Thanksgiving and I have more yams in the fridge than I did on Thanksgiving Day. That’s a whole lotta yams, in case you were wondering. And do you know why? It’s because yams are weird. Now I’m not talking about sweet potatoes, which we all know are delicious in their native pie and fried forms. We are talking yams. There’s a difference. 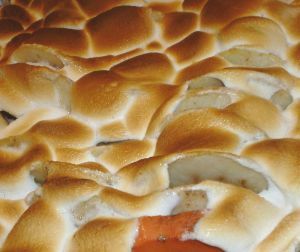 To be delicious, a sweet potato simply has to be fried in a vat of oil, or baked into a crust. For a yam to be delicious, one has to boil it, mash it, add more sugar than a person should consume in a year and then top it with marshmallows. And even then, nobody really wants the yams. We just eat them because they are on the table sitting there all lonely next to the green bean casserole that has been decimated. And inevitably, the yams are tasted, pronounced yummy (um, that would be the brown sugar and marshmallows talking) and then they are put into a big plastic container and stuck in the refrigerator along with the tiny amounts of mashed potatoes, turkey, stuffing and green bean casserole. And four days later, you peek into the fridge hoping to eat something that wasn’t on the menu Thanksgiving day and you are smacked in the head by fifty containers of yams. I honestly don’t know how they do that. But what I do know is that there are a whole lot of yams taking over my fridge right now. And I would love to know how they do that. Is the casserole alive? Do the marshmallows expand in the cold and take over entire shelves of the fridge? Does the brown sugar balloon up, kind of like my stomach after eating the turkey day feast? Seriously, I just want to know how I end up with so many yams. Of course, in the past I have tried to solve the yam issue by not serving yams at all. Oh please. Every person at the Thanksgiving table protested. 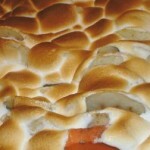 Apparently, it’s not turkey day without a casserole filled with sugar and crusty marshmallows. Who knew? I guess yams are like a table decoration – sort of like candles, only somewhat edible. Of course, it could have something to do with the fact that I am in charge of yam making. Yes, I, a person whose cooking skills rival those of a cavewoman whose clan has not yet discovered fire or the wheel, fix the yam casserole. Every year it’s different, even though I follow the exact same recipe. This is because I always forget one or two ingredients. This year, I noticed the can of evaporated milk sitting beside the sink, while the yams cooked away without it. The real tragic year, though, was the year I forgot to add the sugar. Oh, the horror. But today I will head to the fridge with a stick and attempt to toss the yams into the trash. Wish me luck. You never know when a yam is going to go rogue and attempt to live a long and fruitful life in the back of the fridge, behind the mayonnaise and garlic stuffed olives. You can imagine what it’s like to discover that a year or so from now.